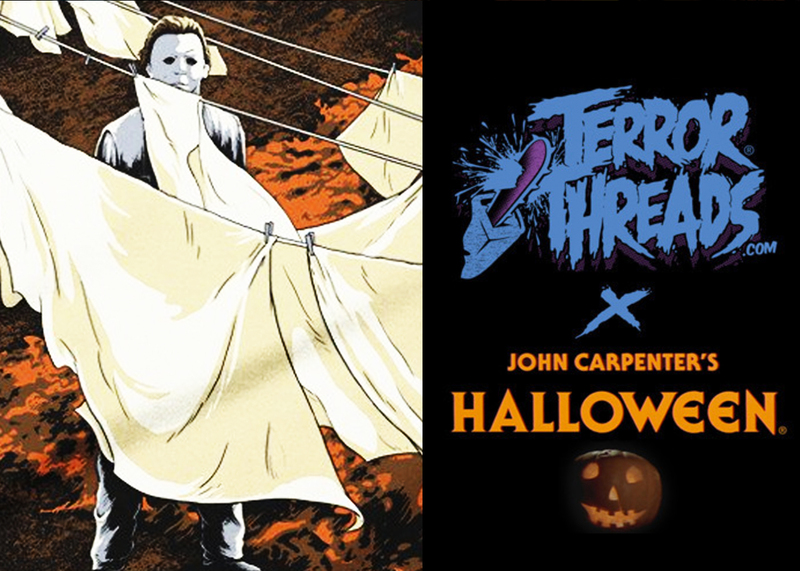 Terror Threads announces round two of their officially licensed line of Halloween (1978) shirts, featuring even more jaw-dropping artwork. 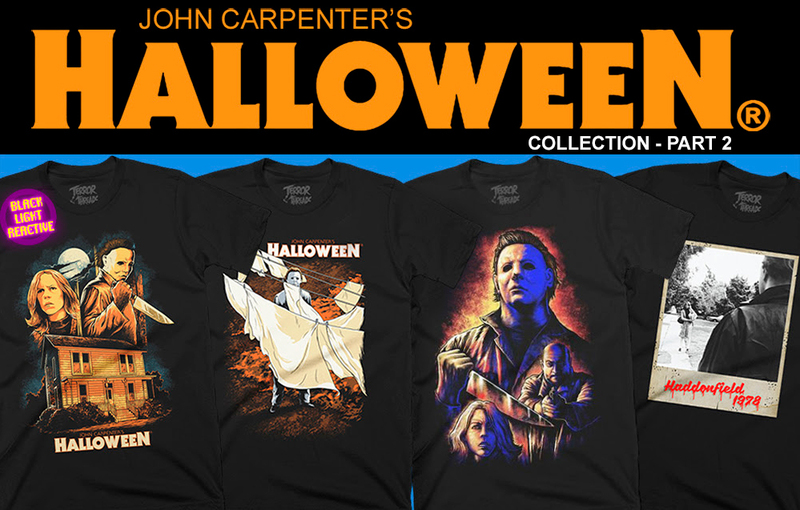 After the overwhelming success and extremely high demand of their first set of four officially licensed Halloween shirts, the wonderful team at Terror Threads is bringing horror and obsessive Halloween fans (like myself) four more jaw-dropping, drool-inducing designs. 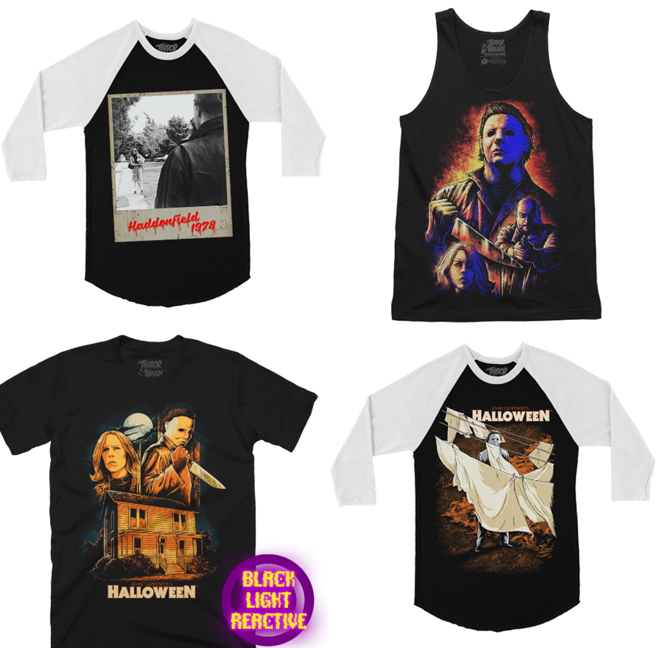 When the original designs for the HALLOWEEN collection were revealed on February 9th, four designs featuring art from the incredibly talented Terror Threads’ designers Toto6 and Ryke1, I was blown away. Judging from the overwhelming response to the collection, I was far from alone. At the time, the new horror apparel favorite teased that this was only the first part of the collection. But it was hard to imagine how they would be able to match that debut offering. Now, with the unveiling of the next four designs in the collection, it’s clear Terror Threads has once again brought their A-game to the line inspired by one of the most popular and beloved horror films of all time. This time, the highly sought after artist Coki Greenway joins Toto6 and Ryke1 to create four more must-have HALLOWEEN designs. 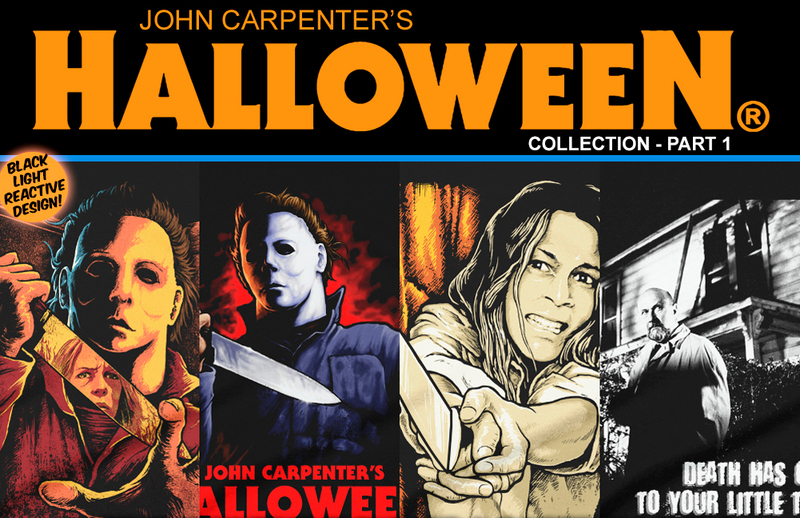 The new collection includes another Black Right Reactive design (trust me, that’s EXACTLY as cool as it sounds) that showcases Michael and Laurie standing over the House where it all began, a menacing Michael staring at you through the sheets, Coki Greenway’s take on Halloween’s Terrifying three, and a classic Polaroid shot of one of the most iconic scenes of John Carpenter’s HALLOWEEN. To make things even better and offer fans more ways to incorporate HALLOWEEN into their horror wardrobes, Terror Threads has added Tank Tops to the entire Halloween® collection! Now, you can get each of the 8 Halloween Designs on ultra-soft and extremely high quality t-shirts, baseball tees, and tank tops. Fingers crossed they add other non-apparel options (pins, phone cases, stickers, mugs, etc) to the store soon as well. As we’ve shared with you before, not only are Terror Threads’ designs to die for, but the quality is among the best we’ve experienced. These shirts are exceptional quality — the kind of tees you’d buy even if the design didn’t take your breath away. They are softer than any I’ve worn, and I’m not lying when I say I practically live in my Terror Threads tees! Perhaps even most important and noteworthy, the customer service is the absolute best. Even as I’ve watched this company blow up and enjoy tremendous growth and popularity, they remain committed to putting the customer first and making sure each of their supporters knows how important and valuable they are. Owner Rick Davis, who we recently had the pleasure of interviewing (read the interview here), is humble, genuine, and truly passionate about horror and supporting the amazing horror community he loves so much. This is not a company in the business to just make a quick buck. They are first and foremost fans, and it really shows. So please consider showing them some love and picking up one (or more) of these mind-blowing new HALLOWEEN designs, or any of the other killer designs from their store.